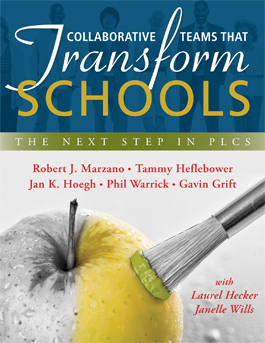 An essential step toward establishing an effective PLC is developing schoolwide norms that unify the practices of individual collaborative teams across a school. Within a PLC, each collaborative team develops its own set of norms, called group norms. Group norms are monitored and reflected upon over the course of the year, to help collaborative teams work efficiently and effectively toward their goals. When creating an assessment blueprint, how many and what types of items are generally appropriate for each level of the proficiency scale? Why is a guaranteed and viable curriculum important? Why should standards be translated into learning goals or objectives? Schoolwide norms generally define and describe the group behaviors in which all members of the PLC will engage. Clear schoolwide norms help ensure consistent, efficient, and purposeful behaviors throughout a PLC’s collaborative teams. Two important schoolwide norms that we recommend for every PLC are that (1) teachers and staff are given formal opportunities to provide feedback about the functioning of the school, and (2) collaborative groups regularly meet to address issues related to classroom curriculum, instruction, assessment, and student achievement. Overall, schoolwide norms communicate that the school is a place where all stakeholders work together, rather than in isolation, and use dialogue to advance their capabilities for the benefit of students (pp. 17–18). In addition to schoolwide norms, each collaborative group in a PLC can create group norms that guide the team and its work. Collaborative teams can generate group norms by considering three questions: (1) What behaviors do we expect to see frequently? (2) What behaviors are unacceptable? and (3) How do we want to handle problems when they arise? Teams can also consider what behaviors are counterproductive to collaboration and then flip these behaviors to determine appropriate positive behaviors. For instance, if a team member suggests that tardiness is a counterproductive behavior, then the team might identify arriving on time as an appropriate behavior and incorporate it into the group’s norms. After group norms are determined collaboratively, team members can discuss how the norms will manifest in meetings throughout the year. A clear set of group norms is essential for creating a productive, purpose-filled environment that prioritizes the improvement of school academics and culture as a whole (pp. 23–24). Once collaborative teams have established group norms, team members can monitor and reflect on the use of and adherence to norms over time. Members of collaborative teams can celebrate adherence to norms and hold each other accountable if norms are not upheld for any length of time. It can also be useful to formally monitor adherence to group norms through the use of a norm-monitoring form. A norm-monitoring form lists group norms as well as related examples and nonexamples and asks team members to rate the group’s adherence using a simple scale. As the needs or specific goals of a collaborative team change, members can also use monitoring and reflection to revisit the necessity of particular norms or make adaptations (pp. 24–25). Assessment of score 2.0 content usually involves numerous short, forced-choice items, such as multiple-choice questions. Typically, five or more questions are needed to assess this level. Items that assess score 3.0 content require students to access multiple pieces of content and often take the form of short written responses. An assessment usually includes two or more items at this level. Score 4.0 assessment items also require that students synthesize numerous aspects of the content as well as make inferences or applications that go beyond what was taught in class. This level is often assessed by an extended essay question (pp. 51–56). A guaranteed and viable curriculum works to reduce variability in students’ education. When the curriculum is viable, all the content can be taught in the instructional time available. Teachers do not have to make idiosyncratic decisions about what content to teach. Therefore, all teachers of a course or grade level deliver the same content to their students, guaranteeing the curriculum and creating consistency for all students (pp. 33–34). Standards, as typically written, often include numerous subcomponents. One standard might encompass several individual elements that each require a separate proficiency scale. Alternatively, a standard might include some content that would be an appropriate target learning goal and some content that is simpler or foundational to the target. By breaking standards apart and rewriting their components as individual objectives, teachers can make the standards more useful and get a better sense of how much content there really is (pp. 37–39).